Living in Dubai means we have summer a little longer than the average folks around the world. From May until October it is so hot, that during the day it is basically impossible to be outdoors for longer than a few minutes. High humidity does the rest. Lots of light and cooling meals are required at this time. 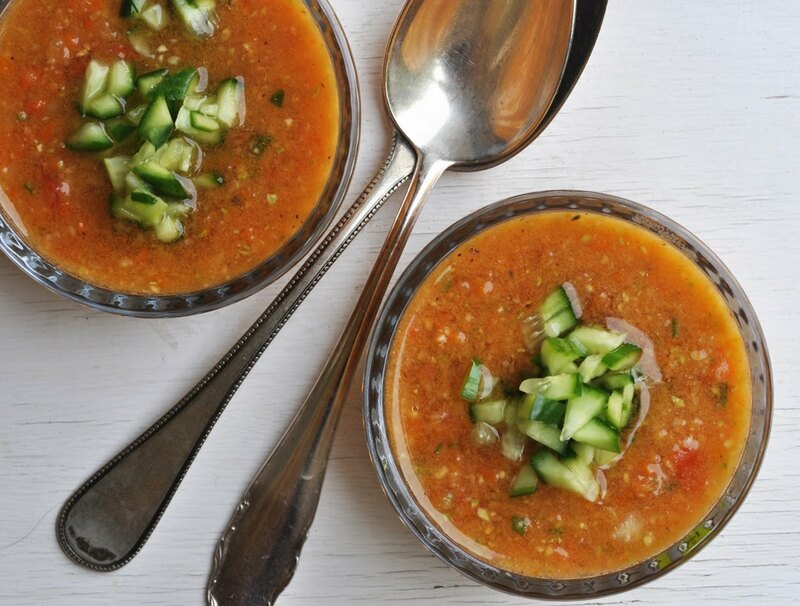 Gazpacho fulfills all needs at this weather: light and vegetarian, spicy and cool. Easy to prepare, and even keeps for a couple of days in the fridge. In fact it gets better by the day. Combine all ingredients (except tomato juice and 2 cucumbers) and blend in a food blender until smooth. Use the additional tomato juice to thin the soup to desired consistency. Adjust seasonings to taste. Keep in the fridge for a few hours before serving. Better the next day. Just before serving, finely chop 2 cucumbers. Sprinkle them over the soup. Serve with croutons or fresh baguette bread.